This genus is accepted, and its native range is Mexico to Ecuador. Perennial. Stolons present. Culms prostrate; 20-30-40 cm long. Ligule a ciliolate membrane (1), or a fringe of hairs. Leaf-blades persistent (1), or deciduous at the ligule (1); stiff. Dioecious. Synflorescence compound; fasciculate. Inflorescence comprising only a few spikelets; terminal and axillary; subtended by a spatheole; embraced at base by subtending leaf. Spikelets solitary. Male inflorescence unlike female; a single raceme. 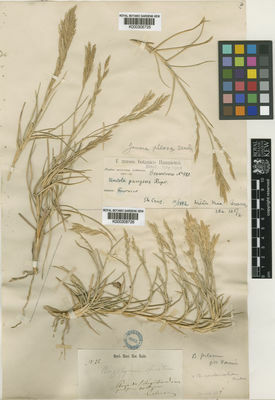 Male spikelets distinct from female. Male spikelet glumes 1, or 2 (1). Spikelets comprising 2-3 fertile florets, or 4-5 fertile florets (1); with a barren rhachilla extension. Spikelets linear; thorn-like; subterete; 15-26.25-40 mm long; falling entire. Spikelet callus cuneate; base obtuse. Fertile florets female. Fertile lemma linear; coriaceous; without keel; 5-7 -veined. Lemma margins closed except for an apical pore; covering most of palea. Lemma apex dentate; 2 -fid. Palea hyaline; 0 -veined; without keels. Lodicules absent. Anthers 3. Stigmas 2. Caryopsis with adherent pericarp; linear. Male inflorescence unlike female; a single raceme. Male spikelets distinct from female. Male spikelet glumes 1, or 2 (1). North America, or South America.